The first three Rush albums "Rush" (1974), "FIy By Night" (1975), and "Caress of Steel" (1975) - re-released as a smart silver package for the many who care. The Rush Archives. 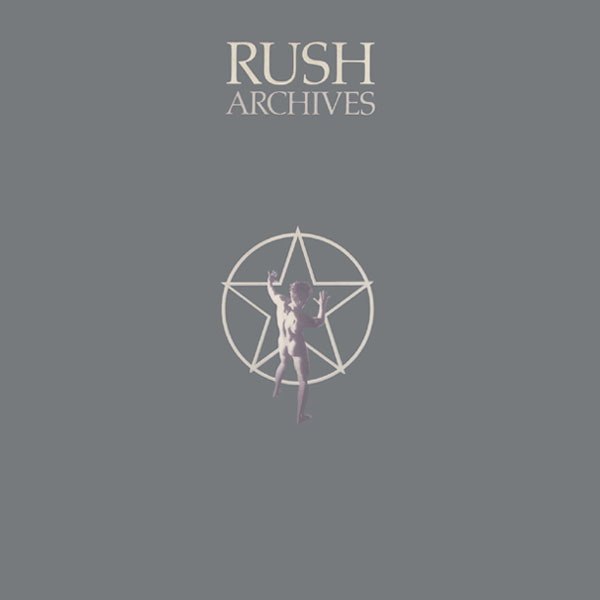 ('Archives' literally means 'public records': Rush typically aware of historical perspective). As I struggled laboriously and reluctantly through its six long sides, which took days instead of the expected few hours, due to my total inability to manage more than one side of its striding, monotonous, pompously structured rock at a time, dots formed in front of my eyes, in the shape of a question mark. Why? Why are Rush so popular? People often verbally attack me about Rush and their ilk, accusing the NME of a total ignorance of what is some of the most popular music of today; Heavy/Metal/Pomp. But it's not so much bigoted ignorance, more a grudging acknowledgement of the existence of the genre and its popularity, and ultimately a recognition that the music is unimportant, derivative, false and above all else IMMATURE. It quite honestly doesn't merit serious analytical space in a rock and roll paper; it deserves very little space at all. No one will deny its presence or popularity, but it's very difficult to write about such complete rubbish with any semblance of belief, without condescension or amusement. Interviews with such groups usually reveal the naïvety and arrogance of the individuals; reviews can merely wallow in disbelief at the strange call and response ritual at live gigs, frown at the hypnotic dangers sigh at the overall musical tightness, impact and ultimate restriction; to review their albums is to get a headache. Rush are the absolute example of a heavy rock group who are extremely popular and who can give critics terrible problems of confrontation. Their popularity does demand at least occasional cursory attention in the same way as a Flintlock album or a Bonnie Tyler gig, but criticism of Rush can either give them the straight dismissal they probably deserve (like Max Bell's Rush live album review) or be in some ways serious, reveal immediate faults (getting immediate, outraged correspondence as a matter of course) and highlight the unnerving motivations of the group itself (like Miles' uncover job). There's nothing apart from the terrible flaws in Rush's music for a critic to grab hold of. It's when the motivation for Rush becomes apparent, and the way it's translated into music (The Power And The Glory) and lyrics (Journeys For Pureness And Power) that the reason for Rush's actual popularity becomes clear. It's rooted in the immaturity of both the group and their fans. Immaturity of emotions, responses, ideals, character. A striving for something they'll both never have. Rush are musically a superficial splodgy mess of the stun of Led Zeppelin, the excessive structures of Yes and the melody of later Beatles. There's six sides of music here in this package, 24 songs and two suites. None, except for maybe the title track of "Fly By Night", has any genuine melodic and structural presence. The more usual workout comprises manic twisting riff progressions and an ultra-active rhythm section that drives the music along with the necessary macho propulsion. Acoustic and classical guitars give some slight textural variations; Geddy Lees' vocals are of the strained, painful, whining type. The real point of the music, its major attraction, is its power. Thrashing about, nose-diving all over the place, thrusting and smashing. There are occasional reflective, acoustic songs that are interruptive, childish - really just token moments. Power is its popularity. After that has hooked their audience, everything is to Rush's advantage. The pretentious attempts at complexity (often by just stopping and starting again) and seriousness attract any rock fan eager for an easy way to pretend to himself that his tastes in music are adventurous and esoteric. The lyrics are calculated to appeal directly to the lonely, confused and immature; they naturally evade any diagnosis of any such problem. The words come from a direct male chauvinist viewpoint. The fantasies Rush concoct deal in mystical searches for pureness, strength and power, both physically and mentally. Rush's fantasies are inspired by resentment - although the source of resentment in Rush's case is not easily definable -but a young fan can easily remodel that abstract and identify with it. This kind of resentment is not far from a spirit of revenge. Rush are certainly a strange substitute for power. Fascism lurking beneath the volume and noise? Sure. And the embarrassment to rock critics lies not in its implications but more in the naïvety of it all, an unawareness of what It Is Really All About. And I bet Rush fans revel in the works of Robert Heinlein.